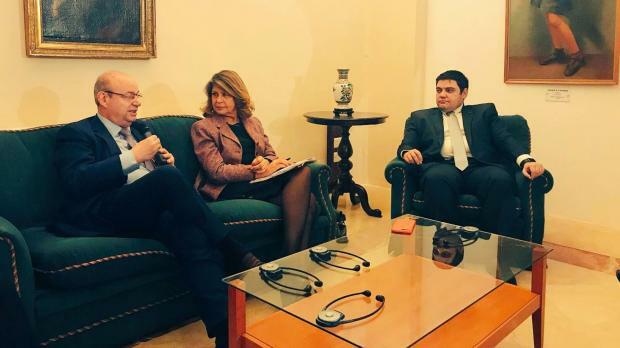 The Great Siege monument represented the fight for freedom and liberty and it was right to commemorate at the same place a person who fought for freedom of expression, MEP Francis Zammit Dimech said. Speaking during the opening meeting of the opening meeting of the European Parliament's mission of the Committee on Culture, Education and Media of the European Parliament in Malta to monitor Valletta 2018 held with Valletta mayor Alexiei Dingli, Dr Zammit Dimech said culture was also about upholding freedom of expression and diversity of opinion. "These are the European values that we cherish." Dr Dingli referred to a motion moved by a Labour Councillor which will be discussed on Tuesday by the Valletta council for the removal of a makeshift monument in remembrance of assassinated journalist Daphne Caruana Galizia. He reaffirmed that the council had no remit to take decisions on such matter and added that given the events which happened last year and since Malta was bound by the EU to give prominence to the European dimension, an important part of V18 should also be about freedom of expression since this was an essential part of cultural expression and should be safeguarded not just in Malta but throughout Europe. Following the meeting, Dr Zammit Dimech joined MEP Silvia Costa (S&D Cult coordinator) who asked to pay tribute to the journalist on the makeshift monument. During the meeting it was also emphasised that Valletta 2018 was not just about ongoing events but even more so about the legacy Valletta 2018 would generate.